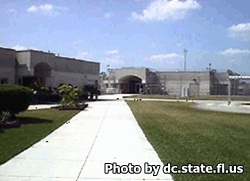 Martin Correctional Institution is located in Indiantown Florida. It is a level VI facility that houses approximately 1,510 adult male inmates in a minimum, medium and closed custody setting. Inmates incarcerated here can earn their GED, learn to read, and get an adult basic education through the academic programs offered. Offenders who have alcohol or drug dependencies can receive substance abuse treatment at the work release facilities. The Chaplain services offered at this facility include religious studies and worshiping services. This facility participates in community work crews that allow inmates to work in a supervised position within the department of transportation, public works, and other interagency services. Visiting is for approved visitors only. To become an approved visitor you must fill out a visiting application and wait for it to be approved. Visiting is on Saturdays and Sundays from 9am to 3pm. You must register for visitation when you arrive at the facility. Registration begins at 8:15am and ends at 2pm. If you arrive after 2pm you will not be allowed to enter into visitation.